In his first collection of short fiction, Keith Lesmeister plows out a distinctive vision of the contemporary Midwest. A recovering addict chases down a herd of runaway cows with a girl the same age as his estranged daughter. A middle-aged couple rediscovers their love for one another through the unlikely circumstance of robbing a bank. A drunken grandmother goads her grandson into bartering his leftover booze for a kayak. The daughter of a deployed soldier wages a bloody war on the rabbits ravaging her family’s farm. These stories peer into the lives of those at the margins–the broken, the resigned, the misunderstood. At turns hopeful and humorous, tender and tragic, We Could’ve Been Happy Here illuminates how we are shaped and buoyed by our intimate connections with others—both those close to us, and those we hardly know. 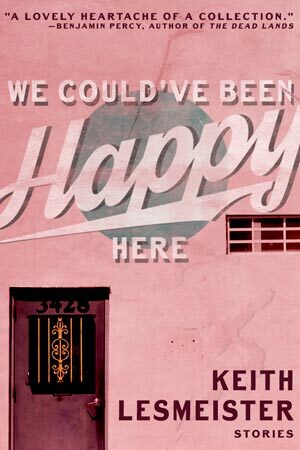 Keith Lesmeister has a series of events coming up for We Could’ve Been Happy Here. Don’t miss out on these opportunities to meet him and hear about the collection! Keith Lesmeister was born in North Carolina, raised in Iowa, and received his M.F.A. from the Bennington Writing Seminars. His fiction has appeared in American Short Fiction, Slice, Meridian, Redivider, Gettysburg Review, and many other print and online publications. His nonfiction has appeared in Tin House Open Bar, River Teeth, The Good Men Project, and elsewhere. He currently lives in northeast Iowa where he teaches at Northeast Iowa Community College. We Could’ve Been Happy Here is his first book. Photo copyright Michelle Pretorius, "Millennium Park Summer 2"